The final round of voting is now open closed to determine the grand prize winner of the Fifth Annual American Humane Association (AHA) Hero Dog Awards, presented by the Lois Pope LIFE Foundation. The purpose of these awards is to “celebrate the powerful, age-old bond between dogs and people – and give recognition to courageous acts of heroism performed by our four-legged best friends,” according to the official website. The second round of voting, which ended June 26, selected the finalists in eight categories. 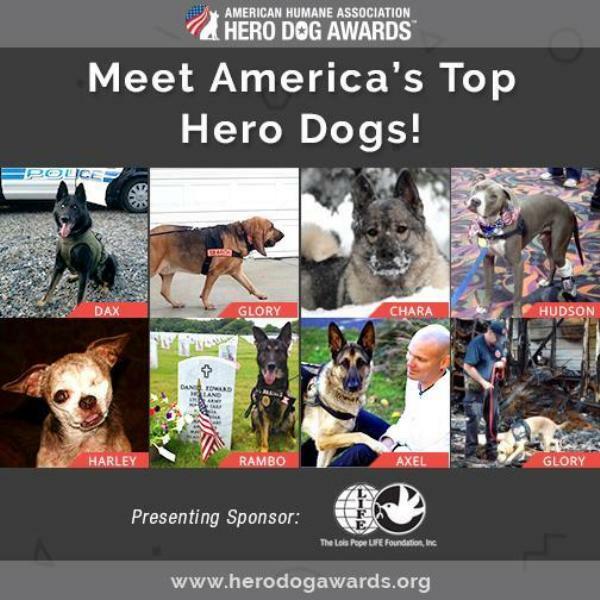 The Hero Dog Awards ceremony will be held in Los Angeles on Sept. 19. The 2015 grand prize winner will be announced during the ceremony. Last year’s grand prize winner was Susie, a Pit Bull/German Shepherd mix who survived a horribly abusive puppyhood and became a therapy dog. She was the inspiration for Susie’s Law, which bumped up the crime of maliciously abusing, torturing or killing an animal in North Carolina from a misdemeanor to a felony. Founded in 1877, AHA was the first national humane organization in the U.S., and is the only one dedicated to protecting both children and animals. It’s still a bit early to mark your calendar, but the 2015 Hero Dog Awards will be televised on the Hallmark Channel in October. As a certified accelerant detection canine, Glory is trained to sniff out the signs of arson fires. She works locally in Beloit, Wisc., and is also called on to investigate fires throughout the state, in neighboring states and around the country. Not only does Glory’s work help reduce the number of intentionally set fires, but she also consoles firefighters and paramedics in Beloit, Wisc., when they are having rough days. To promote fire safety and prevention, Glory and her handler visit local schools and organizations. The finalist in this category, which honors ordinary dogs who do extraordinary things, is Harley, who spent the first 10 years of his life confined to a small cage in a puppy mill. Harley had many health issues, including heart disease, a fused spine and deformed legs. He lost an eye when his cage was power-washed with him inside it. After being rescued and adopted by a loving family, he became the inspiration for the Harley to the Rescue campaign, which in just two years has raised the funds to rescue and provide medical care for more than 500 puppy-mill dogs. Harley goes along on the rescue missions, and also appears at schools and events to raise awareness of the horrors of puppy mills. Chara, of Waynesboro, Va., was originally trained to be a signal service dog for her handler, who is hearing impaired. But when her handler developed reflex sympathetic dystrophy type II with dystonia, a neurological condition, Chara trained herself to alert her handler of impending myoclonic dystonic attacks. When her handler’s infant son had a severe cold and stopped breathing, Chara alerted her, saving the baby’s life. Sgt. Rambo served in the Marine Corps as an explosive detection military working dog, based out of Cherry Point, N.C. He participated in 622 missions on base and in the local community. Rambo was medically retired due to a shoulder injury, and later had to have his left front leg amputated. But that didn’t stop this vet, who lives in Converse, Texas. He became a mascot for Alamo Honor Flight and is currently the mascot for Gizmo’s Gift, a Texas nonprofit that provides financial support to families adopting retired military working dogs. 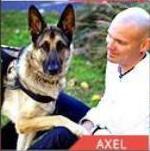 “When I met Axel, he was one week away from being put down, sleeping on a shelter floor. And I was sleeping in my basement with a gun under my pillow,” said retired USMC Capt. Jason Haag on the Hero Dog Awards website. “Now I share a bed with a big and furry security blanket. And he’s a heck of a lot softer.” Haag was suffering from PTSD and a traumatic brain injury when Axel, a German Shepherd, came into his life, thanks to the nonprofit K9s for Warriors. “Sometimes all it takes is a little nudge from Axel to remind me that I’m out of the combat zone,” Haag said. When they were only 3 weeks old, Hudson, a Pit Bull, and his two sisters were nailed to railroad tracks in Albany, N.Y. One of Hudson’s paws had been cut off. Hudson and one sister were rescued but, tragically, the other puppy died. After several surgeries, Hudson became the first dog in New York to be fitted with a prosthetic paw. He was adopted by a loving family and became a certified therapy dog, visiting schools, hospitals and adult day-care facilities. “We try to teach children and everyone we meet that just because you’re different, you are still special in your own ‘wooftastic’ way,” said Hudson’s dog mom.